It gives me great pleasure to welcome you to the College of Pharmacy, National University of Science and Technology, Oman. Earlier the pharmacy program was a part of Oman Medical College which has been successfully operating since 2003. The college of pharmacy offers four year Bachelors in Pharmacy degree program (B. Pharm). The College of Pharmacy aspires to be a premier academic health sciences institution that is recognized for excellence in education, research, and community service endeavors. It is committed to preparing high quality pharmacists who are dedicated to meeting the present and future pharmaceutical care needs of the people of Oman and beyond. The integrated curriculum of B. Pharm program is based on knowledge, skills, values and self-directed learning. The bonhomie atmosphere of campus located in the capital provides you the best environment to learn and practice pharmacy. Our strong curricular and extracurricular activities enable placement of our graduates in community pharmacy, hospital pharmacy, clinical pharmacy, industrial pharmacy, pharmacy regulatory office and pharmaceutical marketing. The patient-centered pharmacy practice is the life-line of our pharmacy program. I am sure you will find what you are looking for at the College of Pharmacy, National University of Science and Technology, to build your career in pharmaceutical sciences and practice. I wish you a bright future for a successful career with us at National University. The College of Pharmacy offers a 4 year program leading to Bachelor of Pharmacy (B. Pharm). The college has an academic partnership with West Virginia University (USA). The campus includes classrooms with up-to-date facilities, advance laboratories, library, on-campus accommodation, restaurants, recreational areas, WiFi access and general computer laboratories. Over 335 students from 22 countries. Around 84 staff members from across academic departments and administration areas. The College of Pharmacy has been one of the constituent colleges of the National University. The College is offering a four year program leading to the Bachelor of Pharmacy. The college is in academic partnership with West Virginia University, USA and has been approved by the Ministry of Health and the Ministry of Higher Education of Oman. Our vision is to be recognized nationally and internationally for quality education in pharmacy and research in pharmaceutical and health-related topics. Our graduates are prepared to play a key role in improving the health of Omanis and other people by providing patient care and improving therapeutic outcomes. For introducing the awareness about the professional responsibility and competency of a pharmacist, the students are required to observe / shadow pharmacists in health centers and community in the first and second year of pharmacy. After successfully completing the requisite course work, each pharmacy student has to undertake professional Practice Experience in hospital pharmacies, community pharmacies and industrial pharmacies. The active support from MOH hospitals, Armed Force hospital, SQU hospital, Directorate General of Pharmaceutical Affairs and National Pharmaceutical Industries in the training our students is thankfully acknowledged. Excellent administrative support and encouragement from the management and deans has enabled the department to progress into a College. 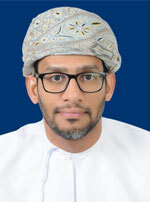 Furthermore, the department has revised the B.Pharm curriculum in tune with the Oman Qualifications Framework and feedback from the stakeholder. The revised curriculum has more clinical courses and electives in clinical pharmacy and industrial pharmacy. The curriculum has been approved by the MOHE and will be implemented from admission in 2019-20 . We had signed memorandum of cooperation with Royal Hospital, Khoula Hospital, Al Nahdha Hospital, Higher College of Technology, Al Khuwair, Waljat College of Applied Sciences and National Pharmaceutical Industries, Rusayl to share the facilities and competencies in research, training and quality assurance. We are optimistic that with the help of dedicated faculty and staff, the College of Pharmacy will develop further into a Center of Excellence in pharmacy education and research. Introduction to cell biology course provides a basic understanding of the structure and function of cellular organelles and components, and the functional interaction of the cell with its microenvironment. Human Anatomy and Physiology course provide the fundamentals of the organization and functions of the human body. Both courses lay a foundation for learning the patho-physiological concepts of diseases and their pharmacological interventions. Topics include anatomical terminology, structure and elaborated functions of cell, tissues, organs and organ system levels as well as cover the remaining parts of body systems. Biochemistry course is a general introduction to biochemistry with an emphasis on human biochemistry. The course includes detailed discussions of bio-molecules and their purification and identification, enzymes and enzyme kinetics, bioenergetics, metabolic pathways, and regulation of biochemical processes in the cell. Pharmaceutical Microbiology course gives insight into pharmaceutical microbiology with special emphasis on microorganisms causing human disease, identification and control of pathogens, disease transmission, host resistance, and immunity and Pharmaceutical Biotechnology course highlights the importance and applications of biotechnology in pharmacy and medicine. Topics include central dogma of molecular biology, recombinant DNA technology, recombinant proteins, nucleic acid technology, gene therapy, monoclonal antibodies, vaccines, stem cell research and therapeutic use of biopharmaceuticals with examples. Biological Sciences labs are equipped with all required instrumentations to conduct demonstrations and lab experiments for educational and research purposes. 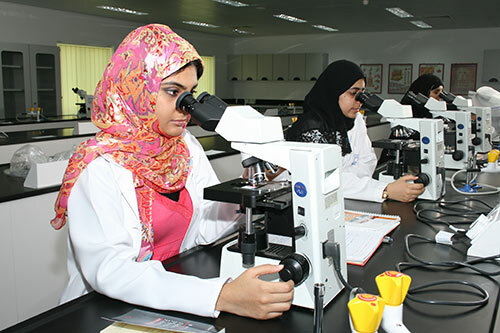 The lab serves the following courses: Cell biology, anatomy and physiology, biochemistry and microbiology. Study the structure and function of systems with models and tissue slides. Acquire the basic skills to pursue meaningful investigations into biological processes. Undergo simple biochemical detections of various biomarker constituents in body fluids using biological kits, UV spectrophotometer, and ELISA. Perform microbiological techniques like staining, phenol coefficient, sterility testing, antibiotic sensitivity as well as clinical interpretation of microbiological tests. Pharmaceutical chemistry courses are integral part of pharmacy education as it enables the students to understand and correlate the chemistry of drugs with their actions/fate in the body. These courses aim to provide educational experience, skills and in depth integrated knowledge at the interface between chemistry and biology disciplines. These courses focus on several aspects of drug design, discovery and development from synthetic and natural sources besides imparting knowledge and understanding of drug stability, formulation into a dosage form, molecular interaction of drug with its receptors, mechanism of action, metabolism of the drug, behavior of drug inside body etc. There are two well equipped state of the art laboratories which cater to the needs of the B. Pharmacy students. A separate research lab with essential analytical instruments is available to support the research activities of the faculty and students. Computer aided drug design, in silico molecular modeling, Prediction of ADMET and biological properties. The branch of Pharmaceutics is one of the key areas in pharmacy. It contains the courses of Physical Pharmacy with lab, Pharmaceutics-1 with lab and II with lab, Dosage Forms & Quality control with lab, Biopharmaceutics and kinetics, Clinical Pharmacokinetics, New drug delivery and Industrial pharmacy. The pharmaceutical sciences combine a broad range of scientific disciplines that are critical to the discovery and development of new drugs and therapies. Pharmaceutics; through which the student will acquire knowledge about different drug formulations that are designed to optimize drug delivery, stability, pharmacokinetics, and patient tolerability. Such knowledge will be delivered via two courses; dosage form and stability and drug delivery. Pharmacokinetics; this subject describes how the body affects a specific drug/chemical compound after its being administered into the human body. Mechanisms of absorption, distribution, metabolism and excretion from the body will be covered in details. The lab Pharmaceutics is equipped with state of the art facilities to undertake research in drug development and delivery of conventional dosage forms and novel drug delivery systems. The courses focusing pharmaceutical care practice are offered from the first year. The students are given an orientation to pharmacy practice dealing with concepts of professionalism in healthcare settings and ethical and contemporary health issues. An overview of various facets of pharmaceutical care and development in pharmaceutical sciences will also be dealt with. The importance of communication skills in the field of pharmacy is introduced including the principles of interpersonal communication and the role of perception and nonverbal communication in effective communication. The community pharmacy course introduces an overview of over –the-counter products (non-prescription) and their appropriate uses and skills to assess the patient’s signs and symptoms that require medical attention versus self-treatment. Students are exposed to handle the query, dispense the medication and patient counseling by the role play carried out in the model pharmacy. Hospital pharmacy course overview of medicine distribution system in the hospitals and role of pharmacist in Drug Information Services, Pharmacy Therapeutic Committee, Nuclear Pharmacy, manufacturing of sterile and non-sterile preparations and quality control of drugs. The Clinical pharmacy including Pharmaceutical care concepts, patient counseling and compliance, drug interactions, adverse drug reactions, pharmacovigilance, medication adherence, pediatric and geriatric practice etc. The final student have under take a course in Objective Structured Clinical Examination (OSCE) designed to provide directed pre-clinical training to students. It ensures proper achievement of baseline clinical competencies prior to entering the institutional training. The cases are developed as real as possible in consideration with all aspects of clinical practice. The public health and epidemiology is dealt in the final year to develop knowledge and skills from Health Care Psychology, Social Interactions and Communication, Pharmacoinformatics and Basics of Health Care. Interactive lectures will be used for selected diseases to exercise how to improve drug benefits and reduce drug risks and the risk of non-compliance. Worldwide development of pharmaceutical care will be also demonstrated. The students will be trained on how to use medical devices and how to apply special dosage forms as well as methods on how to reduce non-compliance. Alternative and complementary medicine will be discussed as well. In the area of lifestyle there will be focus on diets, exercising, abuse of social addictive drugs and food- drug interactions. This course will provide an opportunity for the student to learn about pharmacovigilance as a science, basic terminologies used in pharmacovigilance and global scenario of pharmacovigilance. This course will train students on establishing pharmacovigilance programme in an organization, various methods that can be used to generate safety data and signal detection. It will also help to develop the skills of classifying drugs, diseases and adverse drug reactions. The professional skills and ethics are imparted to students from the first year by shadowing a pharmacist through observational ship courses in the community pharmacy, second year in health center and third year in medicine and marketing. They will also observe activities of the community pharmacy right from the arrangement of inventory, dispensing of prescription medicines and over the counter products and patient counseling etc. Students will also receive training in first aid and cardiopulmonary resuscitation. The experiential training in a community Pharmacy setting for 200 contact hours give the students an opportunity to apply his/her acquired academic skills in a place where the professional practice is carried. The student will be assigned to a preceptor who will supervise the training and impart knowledge, skills and attitudes required for competent pharmacy practice. The hospital pharmacy training in a tertiary care hospital provides an orientation to understand about various activities of pharmacist. The student are given training in ambulatory care, inpatient pharmacy , clinical pharmacy, inventory control , extemporaneous preparation, TPN, drug information service etc. This industrial pharmacy course imparts knowledge and skill in formulation development, quality control and pharma marketing. Please contact us at the following address in order to meet and discuss a number of academic study opportunities available at College of Pharmacy, National University of Science & Technology, Oman.